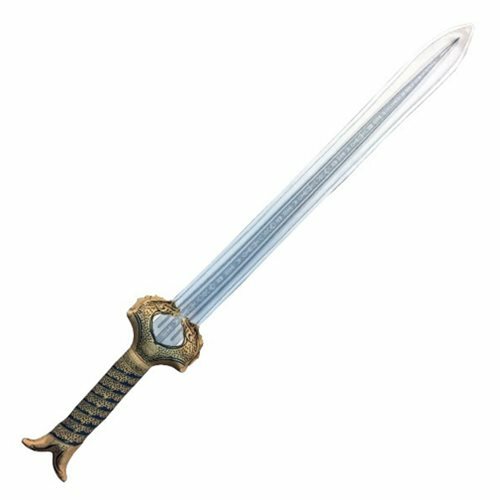 The Wonder Woman Movie Sword SWAT Plush Roleplay Weapon is based on the screen used prop from the Wonder Woman film for accurate, safe role-play action. The sword features a dragon-themed gold hilt and Amazonian runic based script on its blade. To further enhance the collectibles and to add another element of role-play, the Wonder Woman SWAT soft weapon features a series of sounds that play when swung through the air and on impact! SWATs (Soft Weapons And Tactics) capture the fun of stylized fantasy weapons, but executed in soft, safe-for-work-and-play materials, with sounds specifically tailored to each piece. Measures about 30-inches long x 7-inches wide.